Today, businesses need to be able to predict demand and trends to stay in line with any sudden market changes and economy swings. This is exactly where forecasting tools, powered by Data Science, come into play, enabling organizations to successfully deal with strategic and capacity planning. Smart forecasting techniques can be used to reduce any possible risks and assist in making well-informed decisions. One of our customers, an enterprise from the Middle East, needed to predict their market demand for the upcoming twelve weeks. They required a market forecast to help them set their short-term objectives, such as production strategy, as well as assist in capacity planning and price control. So, we came up with an idea of creating a custom time series model capable of tackling the challenge. In this article, we will cover the modelling process as well as the pitfalls we had to overcome along the way. The existing models for time series prediction include the ARIMA models that are mainly used to model time series data without directly handling seasonality; VAR models, Holt-Winters seasonal methods, TAR models and other. Unfortunately, these algorithms may fail to deliver the required level of the prediction accuracy, as they can involve raw data that might be incomplete, inconsistent or contain some errors. As quality decisions are based only on quality data, it is crucial to perform preprocessing to prepare entry information for further processing. where Pn(t) is a degree polynomial and Ak is a set of indexes, including the first k indexes with highest amplitudes. Then, we calculated the Fourier coefficients using The Discrete Fourier Transform (DFT). The effect of the Fourier terms, used as external regressors in the model, is visualised below. We built the trend prediction using the additive model. When the trend and seasonal components are removed from the model, we can obtain the residuals (the difference between an observed value and its forecast based on other observations) from the remaining part to validate and fit our mathematical model. You may notice that there are some negative values present, showing that something unusual was happening during that period of time. We aimed to find out the circumstances causing such behaviour, so we came up with an idea to compile the outliers with a simple calendar and discovered that the negative values tightly correlate with such public holidays as Ramadan, Eid Al Fitr and other. Having collected and summarized all the data, we applied Machine Learning methods based on previous data points as entry features and Machine Learning Strategies for Time Series Prediction. After a few training sessions conducted with ML models, we built a prediction for residuals that can be observed below. 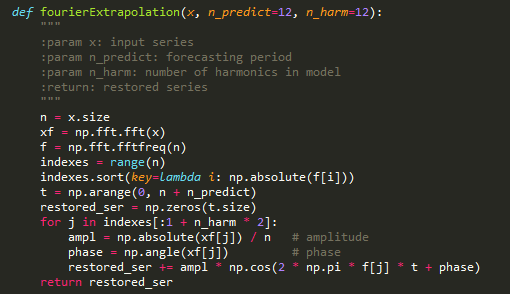 As a result, we got a final forecasting model that minimizes the mean absolute percentage error (MAPE) to 6% for one particular city and 10% for the entire country in general. When building our model, we attempted not only to use the available information, but also discover the factors which could affect the results. This approach helped us develop the model generating more accurate forecasting results faster than the existing models. For example, to train the developed model to make a prediction for 300 different cities, we need about 15 minutes, while other methods require about 6 hours. Also, the fact that the deviation between the actual demand and the predicted demand was only 6% resulted in possibilities to resolve mismatches between supply and demand. Now, the customer can more quickly and more easily plan the capacity, minimize future risks and optimize inventory. Well, the results are quite promising. And there is a long way we can go further in improvement of this model, so it could provide accurate long-term forecasts as well. As for now, the degree of error for long-term predictions is still quite high. Sounds like a challenge? So stay tuned! Some new experiments are coming!